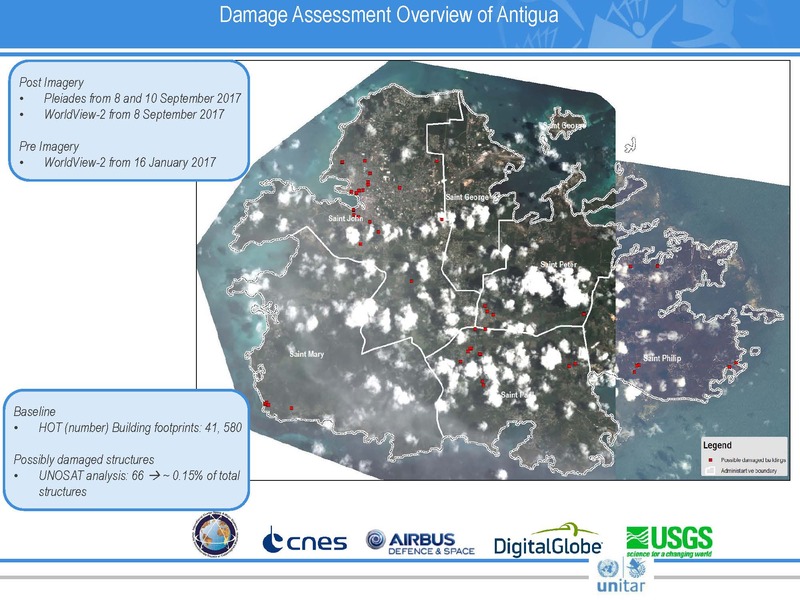 This product illustrates UNITAR-UNOSAT´s building damage assessment of the island of Antigua. Due to cloud cover, UNOSAT has used several satellite images; as post imagery: 8 and 10 September 2017 (Woldview-2 and Pleiades satellites). We only observed minor damage on the island of Antigua in the form of a few scattered, possibly damaged structures. According to the pre-building footprints provided by Humanitarian Open Street Map (41,580 building footprints in Antigua), less than 0.15% of the total number of structures on Antigua Island were categorized as possibly damaged. This is a preliminary analysis and has not yet been validated in the field. Please send ground feedback to UNITAR-UNOSAT.